Images from throughout the Middle Kingdom, taken using both digital and traditional film cameras. From the architectural splendors of Beijing, to the traditional mountain peaks of Yellow Mountain, and everything in between. Huangshan (Yellow Mountain) is a range of incredible peaks and valleys, some of the most famous scenery in all of China. This is the scenery that, for centuries, has been depicted in Chinese artwork, and in 2009 I had a short opportunity to photography it. The weather changes quickly, but even the frequent fog and low clouds doesn't mask the overall beauty of this place. One can walk along well made trails for days throughout the mountain tops of Huangshan. I had explored for hours before coming upon this scene. Literally a tree growing out of the rock of a vertical mountainside, shrouded in mist and fog. 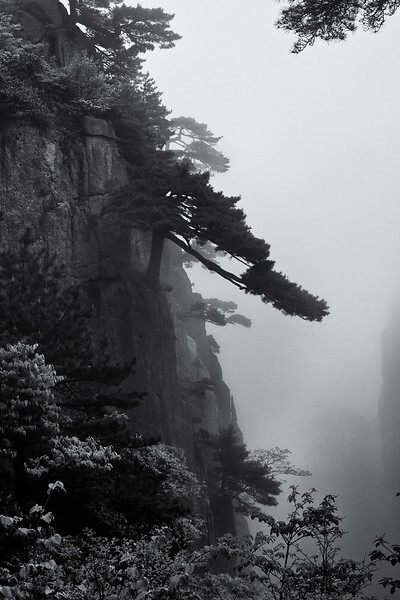 A stereotypical Huangshan scene, but one that resonates and draws the eye. 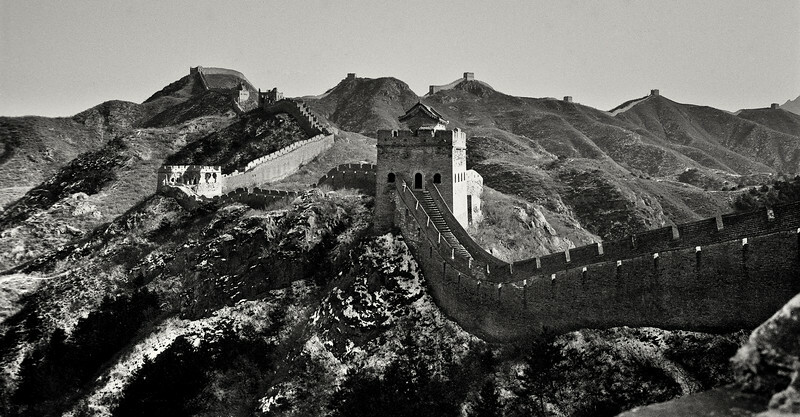 I love this image of the Great Wall. Yeah, I might be boasting a bit, but I love it. I love the fact that it starts right where I'm standing and goes on for miles and miles. I love that in this frame I can see the wall track the ridge line, both near and far, as it goes into the distance. I've experienced the wall many times, but this long hike from Mutianyu to Simatai was one of my favorite days on the Wall. I had it almost entirely to myself, the weather was cold but good, and the air was relatively clear. It was a good day, and one that brings back great memories. Leica M7, Zeiss 35mm f/2.8 C-Biogon, Ilford PanF 50 film. The Temple of Heaven was one of my favorite ancient sites to visit in Beijing. The iconic buildings are the main draw, but the parks and other smaller buildings on the grounds provide a unique calmness. This peacefulness presents a welcome change the noise and congestion of the city, which begins again just on the other side walls and gates. This image was taken in the main temple hall, and shows the engineering prowess and attention to intricacy that the ancient builders had. I loved photographing Huangshan (Yellow Mountains) in China, even through I wasn't there exclusively to take pictures. The Yellow Mountains experience beautiful tides of clouds moving in and out each day, and given the height of the mountains one can frequently be above the thick blanket of clouds. 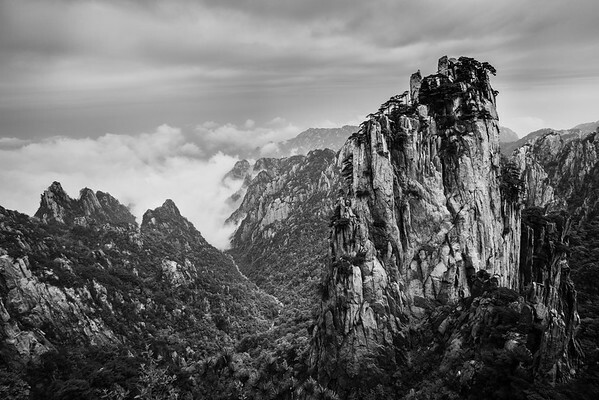 Huangshan (Yellow Mountains) is one of the best places to visit in China if you like stunning landscapes, steep hikes, and dramatic photographic opportunities. I’ve only been once, and am very glad I had the chance to get there. I was an avid photographer at the time, but it was still early in my photographic progression, and I’m sure that a visit today would yield better results. A long cable car ride takes you up to the top of the mountain, or a visitor can opts to do the full day hike up to the top as people have done for centuries. It goes without saying that I (with family) took the cable car, but that didn’t mean we went without hiking. The trails are all paved with beautiful concrete handrails made to look like tree trunks and limbs. While the trails are smooth, the vertical elevation ascended and descended each day was immense. And, there is no escaping the large number of people that visit this iconic scenes. But, it’s absolutely worth it. This specific image is one that I have returned to years after shot to see if I could improve upon it. Using different panoramic stitching software and different post-processing techniques. It’s worked out quite well, which does not bode well for my free time–now I’m going to have to re-process many other photos. Even after the Olympic flame had been extinguished, the scope and scale of the Olympic games continued to permeate Beijing. The city had gone through a tremendous change in the lead up to the Games, and the achievements will continue to be seen for years afterwards. 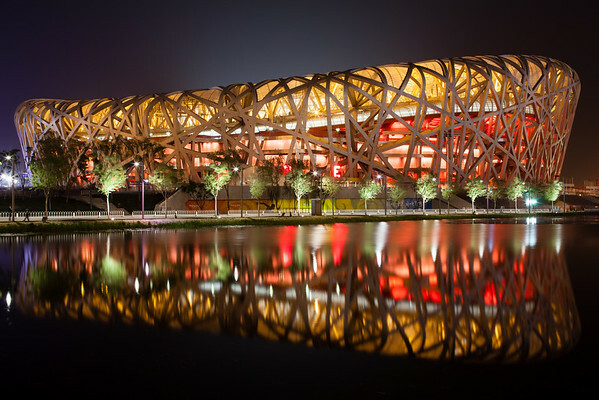 One of those achievements is the National Stadium, better known as the Birds Nest. 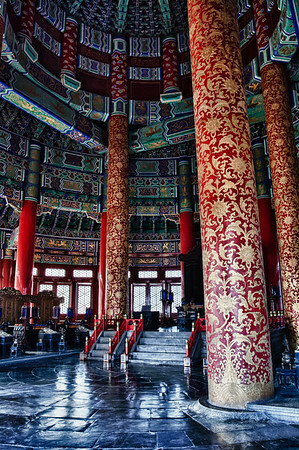 An incredible building achievement, both inside and out, it remains the dominating feature in northern Beijing. The Chinese have a fascination with rocks, and an even greater fascination with naming them. I guess that's to be expected when a country's history is over 2,000 years long, and people have been visiting and naming the sights within that country for as many years. The small rock near the middle of the frame is The Monkey Watching the Sea; I actually think it looks like a small, hunched over monkey looking out into the sea of clouds. 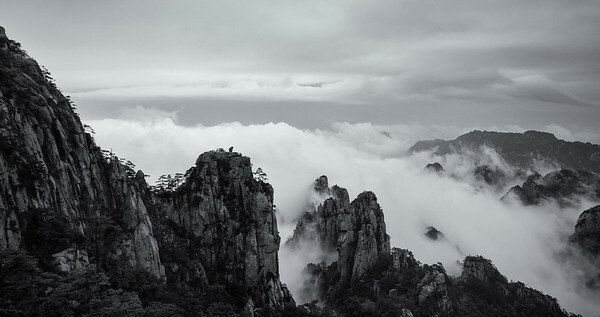 Huangshan is one of the most incredible areas in China for landscape photography, a welcome reward after the hours of hiking required to get around the mountain. 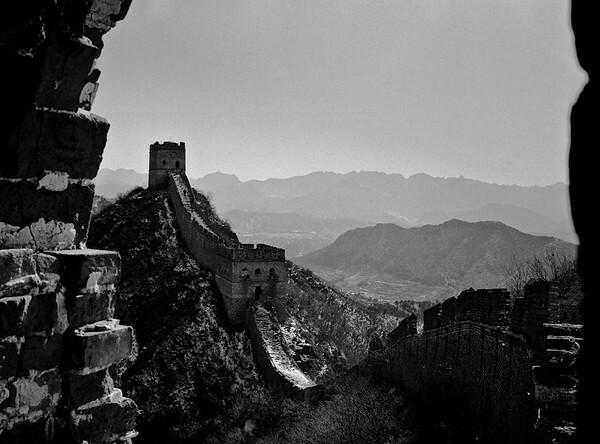 Another image from my long Mutianyu to Simatai hike in early 2010. 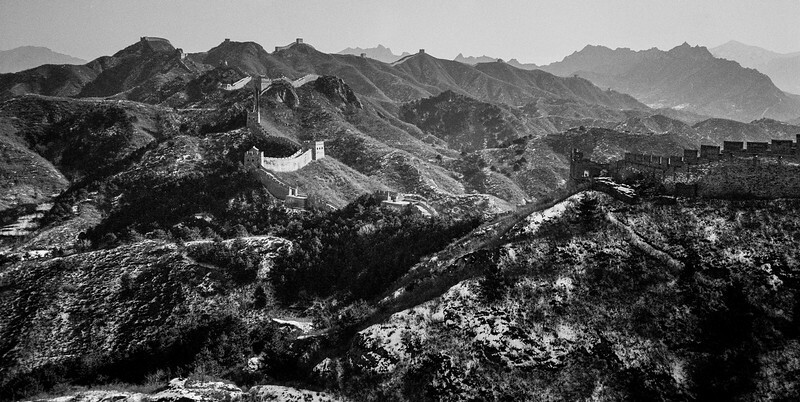 Like a similar image, I love how the Great Wall can be seen tracking the ridge line through most of this image. The half crumbled guard towers, as well as the fully restored towers make a nice contrast within the scene, and seeing how the Great Wall heads off into the distance helps portray the greatness of this man-made wonder. Leica M7, Zeiss 35mm f/2.8 C-Biogon, Ilford PanF 50 film. Photographing on the streets of Beijing was probably my favorite activity while there, and it became even more exciting after the sun had gone down for the day and the only light illuminating the scenes was from the street lamps and lights in homes. In this instance, I liked seeing a group of women playing mahjong inside a brightly light room, while outside it was extremely dark. The challenge here was to expose correctly to that details, both inside and outside, were retained. Zeiss Ikon, Voigtlander 35mm f/1.2 Nokton, Ilford HP5+ film. While my other images of the Great Wall show not only the far but also the close, this image attempts to put the size and scope of the Wall into perspective by showing it in the context of the greater area. When on it the Wall seems bigger than life, but when seen from even a medium distance, it appears smaller and less imposing. I wonder if that is what potential invaders thought as they viewed the Great Wall from a distance during their approach, only to be created with a nearly impregnable structure when they arrived at its base? 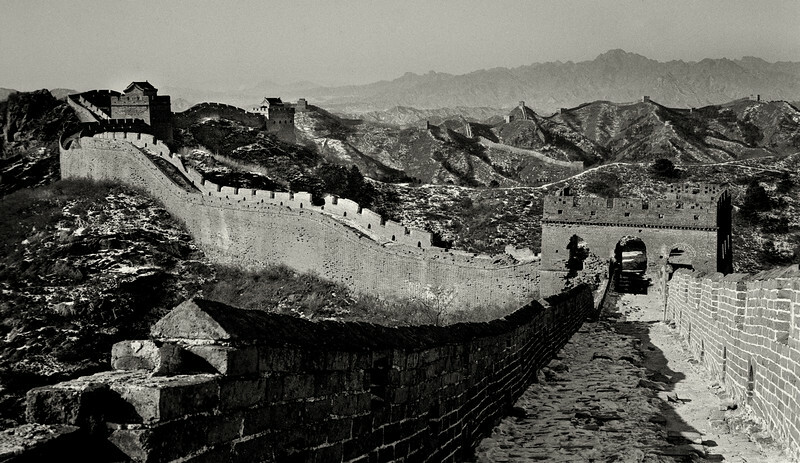 This image helps show the Great Wall as a small piece in the rocky and mountainous geography that surrounds Beijing. Leica M7, Zeiss 35mm f/2.8 C-Biogon, Ilford PanF 50 film. There is not a lot of fine detail in this image, which usually would turn me off. But, in this instance I think it is what makes the image. 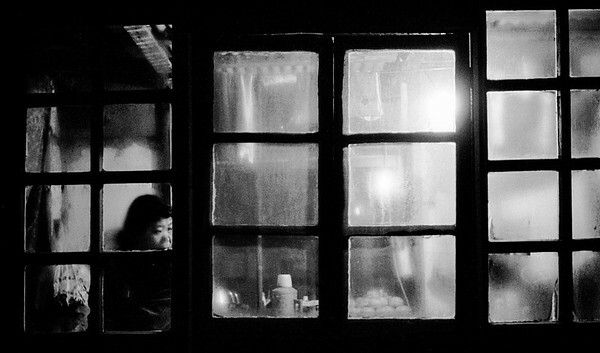 This woman appears to be cooking dinner in her kitchen, which has a series of windows looking out onto an alley. Obviously because she can look out means I can look in. It must have been warm in that kitchen, probably humid too as I vaguely remember her steaming rice of boiling noodles. The steam had fogged up many of the windows, and the thin layer of grime that also covered the windows reduced the clarity a bit. The bright light inside the kitchen provided the only illumination, and one can even seen the woman is a bit blurred as she moved during the relatively long exposure. Zeiss Ikon, Voigtlander 35mm f/1.2 Nokton, Fuji Neopan 400 film. Another great nighttime street scene in Beijing. I wish I could remember where I was, but I can't. I'd walked for hours by this point in the day, shooting roll after roll of film. I came out of a Hutong and found myself in what had apparently been an open air market just hours before, with a couple of fruit and vegetable stalls still remaining. 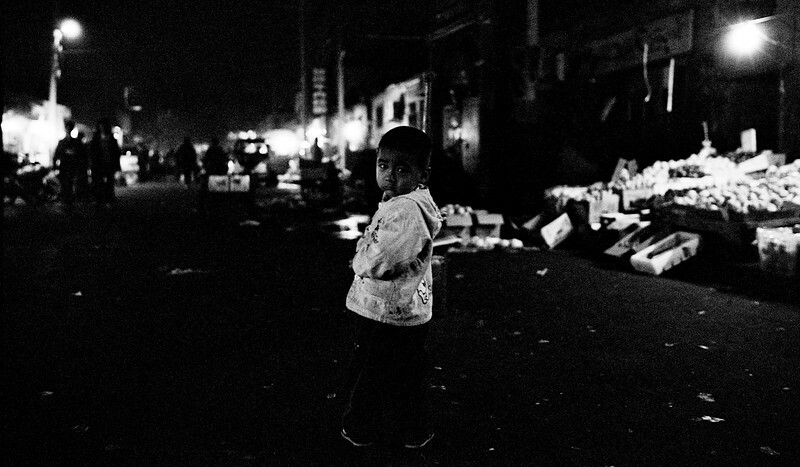 This little boy was walking down the street, lit by just a few street lamps. I wanted to capture the image with him walking away from me, but just as I was about to press the shutter the boy stopped and turned. Maybe he heard me walking behind him, or maybe something else grabbed his attention. What ever the cause, it resulted in a great posed image. It all comes down to the expression on his face. Zeiss Ikon, Voigtlander 35mm f/1.2 Nokton, Ilford Xp2 Super 400 film. 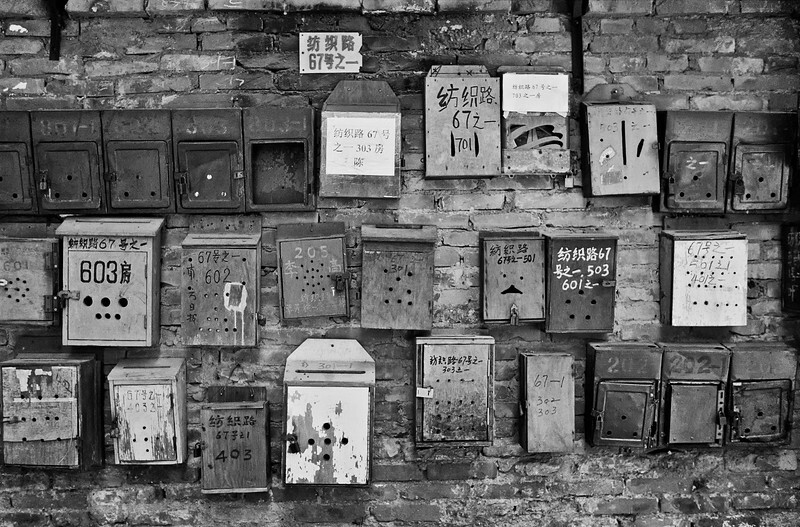 On a walk through Guangzhou, China, I came across this wall of mailboxes. I just thought it was such a great sight that I had to take a picture. The texture of each mailbox, some with handwritten addresses and others with printed numbers, all different sizes and makes. They just look like they've been around for a long time, weathered all sorts of storms, and been the recipient of good and mad mail for their owners. Bessa R4A, Ilford XP2 Super 400 film. It was a cold and windy day; one I remember quite vividly. I walked from Mutianyu to Simatai over the course of about 6 hours. I saw only a handful of other people on this mid-Winter day; most were not willing to brave the long walk on such a cold day. I came to one of the guard towers on the wall, and looking through the windows opening had a great view of the climb to come, first down and then back up over the snow covered rock steps that make up this unrestored portion of the Wall. Leica M7, Zeiss 35mm f/2.8 C-Biogon, Ilford FP4 Plus film. This image is an example of why the camera doesn't really matter. 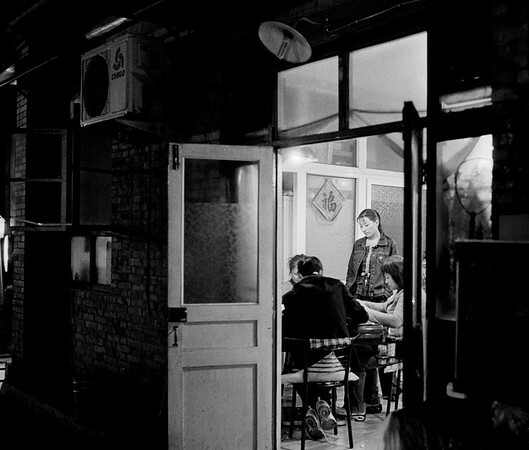 I captured this image on one of my many trips to Shanghai, when I was only carrying a little point and shoot. Exploring a little alley, I came across this wall with great texture. As I followed it down the alley I saw that some of the plaster covering the underlying brick had crumbled away. 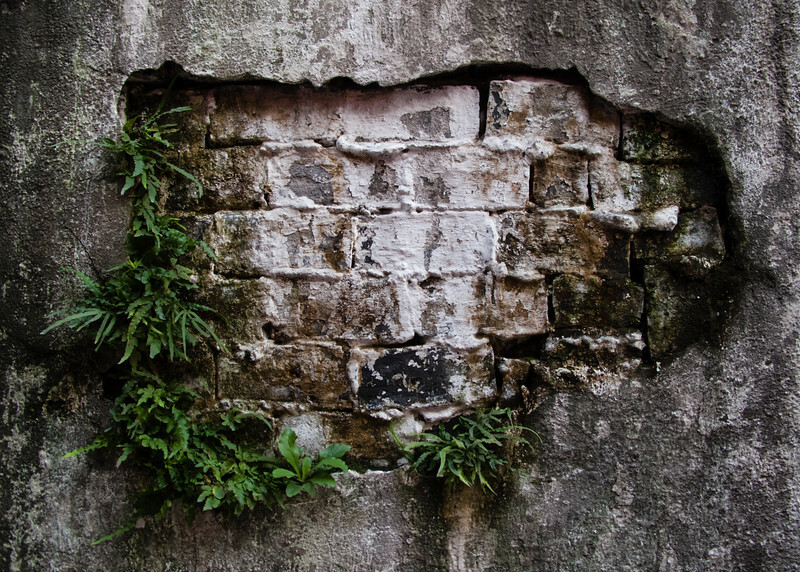 Weeds had infiltrated the brick creating something that reminded me of a wall garden. Despite paint and probable cleaning, the dirt and grit of Shanghai is clearly visible, and helps make the vegetation look even more vulnerable.